Good morning! Can you believe that it's December 1st already? Yikes!!! I have another card for my Christmas stash to show you today. For a change, I went with some traditional Christmas colors. I used the Card Positioning Systems sketch from a week or so ago, CPS143. 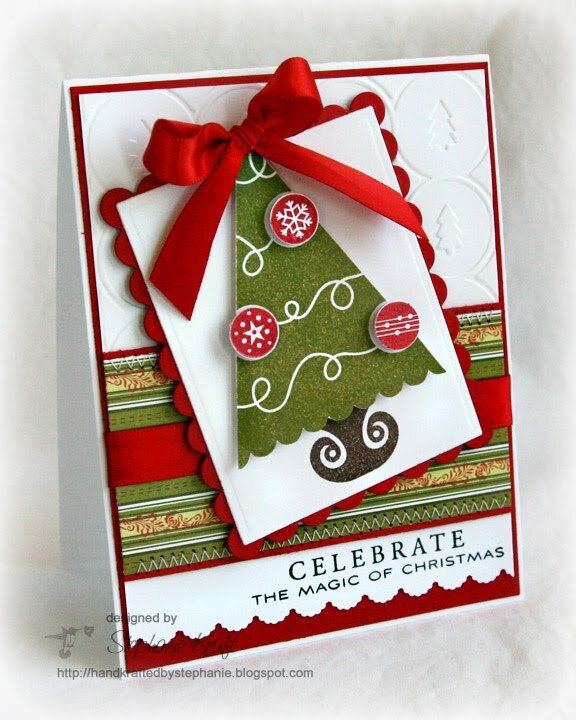 Accessories: Rectangle and Scalloped Rectangle Nestabilities (Spellbinders), Scalloped Scallop border (EK Success), Winter Trees embossing folder (Provo Craft), Ribbon, Foam tape, Thread, Sewing machine. Such a pretty card! I love that embossing folder.